I’m sitting in a hotel in Philadelphia. Traveling for work. Less than two weeks ago my son Alexander Gabriel was born. “Xander” A new little child for us to care for, to teach, to fear for. Two years ago I wouldn’t have said fear for him, Cancer changed that. Now there will always be that little voice in my head “I’m cancer and no one is safe”. I thought about this the three hour drive here. I recorded my thoughts, broke down shopping for a gift for Maddie and Katie because it hit me where two years ago I would need to buy three monster high dolls, now I only can buy two. I had a whole blog written, full of Doom and Gloom, the pain and suffering us as a family deal with on a daily basis. That voice, that fear. The struggle of getting out of bed each morning. However this morning I decided I wouldn’t put that blog up. Instead I would talk about my Heroes. I’ve said countless times how Gabby was and is my hero. The Last time I touched her face, held her hand was 14 months and 17 days ago. The last time I felt the warmth of her body was 14 months, 17 days, 18 hours and 15 min. I remember it like it was yesterday. Where her neck bent over her shoulder. I nuzzled my face into that spot and said I love you baby. Yes Gabby is my hero. But there are three other amazing women who are also my heroes. Carolynn, Madison and Kaitlyn Vogel. Three strong, brave women. Maddie and Katie saw their sisters’ life end that night and January 16th they were in the hospital room as their brother started his. These two little girls have seen such horrible things, and still go on, still fight to survive and regain some form of normalcy. When Xander was born a few weeks ago he was having trouble with his breathing. I took the girls down to the cafeteria and told them. Katie casually asked: Is he going to die? I was shocked; I asked would she have asked that had Gabby gotten sick? Her reply: No, But that was before I knew kids die. Now I do. Carolynn is my hero. Where I have always been the dreamer, a big kid, a goofball. She has been the adult, the planner the voice of reason. While I went to work she managed the house, the kids, the things that mattered. Recently I was made aware of a contest where people could nominate a mother as Unstoppable on the Live with Kelly and Michael Show. The winner will receive $100,000. I know we live in a fast paced world. We are constantly moving and never seem to have time. But if you know my wife, Carolynn, or have been touched by our story, please consider clinking the link below and nominating her for Live with Kelly and Michael’s “Unstoppable Mom Contest.” The contest is meant to highlight “Unstoppable Moms” that go above and beyond for their kids. Four finalists will be featured on Live with Kelly and Michael, with the winner receiving a $ 100,000 prize! If you are new to our page or don’t know Carolynn personally, let me paint a picture for you. Carolynn spent every single day of our Gabby’s life with her, including the last 3 months and 12 days as cancer stole her from us. Where most would wish nothing more than to crawl into a hole and disappear, she managed to move, care and make sure our other two daughters were handling life the best they could during this horrible time. She also helped and supported me while I was diagnosed with a chronic illness. She helped me to get better…to lose weight, eat better, and put up with my moodiness! 😉 And believe me I can be a real A@$hole at times. She helped as we formed a foundation in order to fight for and help other kids dealing with cancer. Never expecting anything in return, but for others to not to feel like we do, to not have to know the pain of one day saying “I outlived my daughter!” She helped assemble the foundation’s board, plan every single event on our calendar, and handle all the behind the scenes work that few are even aware of. She could easily have ran away and hid away from the world. Instead, as President of The Get Well Gabby Foundation, she was a vital part in the foundation reaching an agreement with A.I. DuPont / Nemours Children Hospital to donate $125,000 this past December to fund a ground breaking research software system and the Child Life Playroom opening in the new wing of the hospital next spring. She isn’t just the unstoppable mom for Kaitlyn, Madison, Gabriella and Xander. She is the unstoppable mom who is fighting for all of your children now. If she is picked to win this $100,000 it will all go directly to the foundation to fund our mission. She wants nothing for herself. All she wants is to make a difference and never feel like cancer won. She won’t let that happen! She is my Hero. If that isn’t unstoppable I don’t know what is. 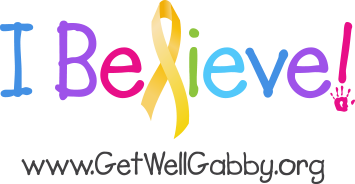 All you need to do is email us at: Unstoppable.Mom@getwellgabby.org and we will send you a quick summary of her information that you will need in order to nominate her on the show’s website. Then simply click the link below, register with the show’s website if you haven’t already done so, and then fill out the nomination form with the information we provide. All submissions must be received by 6:00 PM ET on February 8, 2013. The more nominations she receives, the better her chance of being selected as a finalist and being featured on a segment of Live with Kelly and Michael on ABC in March. Win or lose, just the exposure our “Unstoppable Mom” and the Get Well Gabby Foundation could receive on national TV could be just the push we need to make that next step that we are so determined to take! But to do so, we need your help!!!! Believe in “Unstoppable Mom’s” like Carolynn! !